Anybody who lives in the West Bloomfield Township area and who is looking to rent a party bus can immediately stop their search. Rockstarz Limousine and Party Bus is in the business of providing our clients with a party bus ride to remember, no matter the reason for the celebration. When checking out the possibilities of renting a party bus in West Bloomfield Township, you are going to want to be sure that all of your needs are being met. With a professional driver to look after you, and with even more space than ever before to accommodate more guests, the chances of you not having an amazing time are just non-existent. Of course, our West Bloomfield Township party bus rental service is specifically designed to provide you with a stunning atmosphere for your party since we know that this will really help things to go with a bang. That is why we have included a top of the range stereo system mixed in with a laser light display that just helps to provide you with some extra atmosphere. 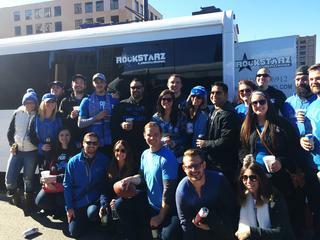 Previously, individuals have looked at using our West Bloomfield Township party bus service to celebrate a wide range of things, and no matter what it may be, we can certainly help. We can accommodate a special birthday celebration, an anniversary, a party just because you feel like it, or even a bachelor or bachelorette party. The choice is up to you. So, all that is then left for you to do if you do reside in the West Bloomfield Township area is to give us a call here at Rockstarz Limousine and Party Bus. The other option is to use the online form on our website and a member of our team will be in touch as soon as possible in order to then go ahead and discuss your requirements.